This year I planted three kinds of basil: the sweet Genovese that is typically used for making pesto and seasoning Italian food, Thai basil and lemon basil. A week or so ago, I picked all three and made a pesto with them for pasta. As I learned, Thai basil probably should not be substituted for sweet basil leaf for leaf. Its flavor is stronger, more minty. It is, as one blog described it, the “spicier, sexier” basil. The plants themselves are gorgeous, with purple stems and a purple flower. 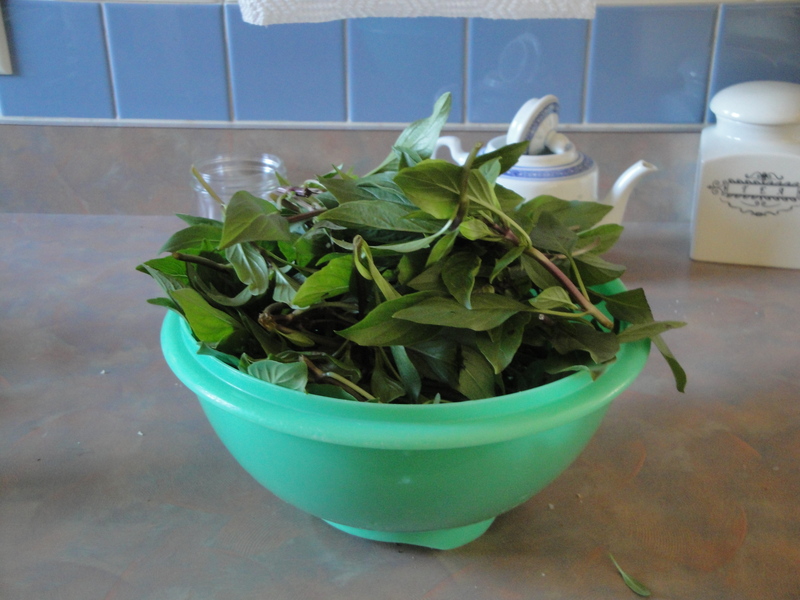 But I hate to not use the leaves, so I did some searching around the internet for a way to preserve Thai basil. There were not a lot of recipes, but the ones I liked best used the leaves to make an Asian-inspired pesto-like condiment. Here’s what I ended up doing: I put 3 cups of leaves in the food processor along with about 2/3 cup peanuts, the juice and zest of two limes, some salt and five big cloves of garlic. If I would have had them handy, I would have added a a couple of hot peppers. I also added a tablespoon or so of water just to get it all congealing nicely. I processed it into a paste, then divided it among four sandwhich bags, which I flattened for easy storage and froze. (I also marked the bags carefully to make sure the pesto and the nonpesto do not get mixed up.) The flavor of the nonpesto was bright and zippy. I can see adding this to a steaming bowl of Asian soup or a noodle dish with shrimp and vegetables. I’m still figuring what to do with my lemon basil. How do you treat these unusual herbs? Sounds delish. The best pesto I ever ate was made from oregano. But it could have been all the butter added to the bruschetta come to think of it. I used my lemon basil to make a simple syrup. It was great added to iced tea!